Does Gmail support HTML imagemaps? 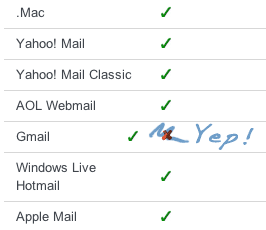 I ran a test myself because if you search for email client support of imagemap-clicking, you’ll see everyone pointing to this article from 2007 which sadly reports that Gmail is the only significant email client that does not support HTML imagemaps. Sometime between then and now (July 2010) Gmail added HTML image mapping support, so those of us who are in the business of designing email newsletters can rejoice and take advantage of this useful oldschool feature. By the way, if you are an email newsletter designer and you had given up on using background images because of Outlook 2007’s terrible support in this regard, have a look at this interesting workaround. but it’s Aug 2010 & my imagemaps are still not working in gmail. Can anyone guess why? I’m not convinced. I just tried it and none of the image maps worked for me. Can anyone confirm/deny? My question is how to *create* them in Gmail. Is this possible? I have done this already and I can confirm it. I was able to know how to do it by reading the code of emails I got from ebay. It still uses the old school way of doing image maps. I Just tried and its 2013 and I was not able to click on an image map I created and put into MailChimp. It did work in outlook.